The landscape for LGBTQ inclusion is changing every day. In the US, an estimated 1.4 million adults in the US identify as transgender. A study put out last year by the Williams Institute discovered that 27% of youth in California are identified as transgender or gender non-conforming. When thinking about younger generations, we know that in the year 2025, millennials will represent 75% of the workforce. And millennials are more than 2xs as likely to identify as LGBTQ and more likely to identify as non-binary or genderfluid than previous generations. For employers, it is no longer a matter of what to do if they have transgender employees, but a matter of preparing for when they have transgender employees. This session will provide an environment for professionals to elevate their cultural competency of transgender inclusion. 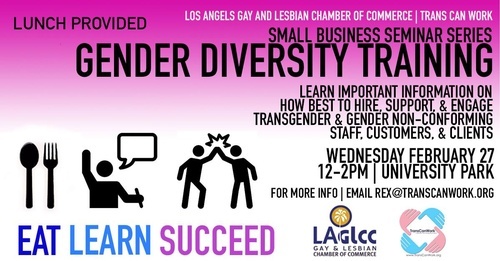 Learn important human resources information about how to hire and support talented employees who are transgender and gender non-conforming (TGNC).